Frederic Marlett Bell-Smith emigrated to Montreal from England at age 20. During his years in London, Ontario (1881 – 1888), he made a lasting contribution to the city’s art scene. He helped form the Western Art League and supported plans for a public art gallery. In 1896, he invited Londoners to choose which of his works should be donated to the city. Bell-Smith’s The Wave (c. 1894) inaugurated what eventually became the permanent collection of Museum London. Championed by Londoners, Bell-Smith earned broader acclaim for his painting commemorating Queen Victoria’s tribute to Canadian Prime Minister John Thompson (1845-94). In the years that followed, his work was exhibited in the United States and England. 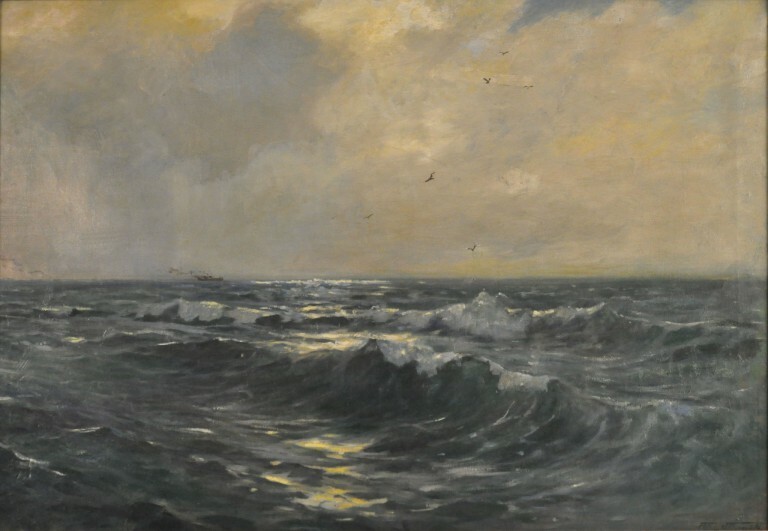 Pacific Breakers differs from The Wave in its dynamic composition and dramatic handling of light and shadow. Though its definitive date is unknown, it was certainly painted after Bell-Smith became the first Canadian artist to gain access to the mountain stretch of the Canadian Pacific Railway (1887). Upon returning to his studio, he relied on photographs and sketches to produce his paintings. Bell-Smith maintained a lifelong passion for the grand vistas of his adopted country. He continued to visit the Canadian West until shortly before his death in 1923.